Showing results for tags 'master samurai tech'. Training at the Master Samurai Tech Academy is already a killer deal: comprehensive, state-of-the-art training that’s online and on-demand at tuition low enough that anyone can afford it. Well now we’re kicking it up to 11 with the Master Samurai Tech Alumni program. If you have been certified* in the Fundamentals course at the Master Samurai Tech Academy or at the Mr. Appliance Academy (Bundle 1 only), you can get full tech access to our tech support site, Appliantology.org, with no annual fee. Yes, as in FREE. You heard that right. You would be a Master Samurai Tech Alumnus at Appliantology with the same level of access and all the benefits of a Professional Appliantologist member (read all the benefits of PA membership here). That’s a $197/year value-- FREE! What’s the catch? No catch but there is a small difference between PA and MST Alumnus membership. PA members can continue to renew their membership at the annual rate and can download and request all the manuals they need regardless of how much or how little they participate in the forums. The MST Alumnus membership is also annual but instead of paying with money, you “pay” with participation in the forums. Each year when your membership comes up for renewal, you need about a 2:1 post to download ratio to renew [UPDATED]. That means that as a general guideline, you need to have made two posts for every download. This is super easy to do and active Appliantology members are already far exceeding this ratio without even trying. The idea here is not to place a burden (because it’s not)-- it’s to discourage people from getting the MST Alumnus membership and simply downloading manuals without interacting with the other members. This really is a killer deal and a special perk for certified Fundamentals graduates! Why are we offering such a great deal? Simple: We want to encourage more techs to successfully complete the Fundamentals course and get certified. This helps them be better techs and helps the trade in general. Certified Fundamentals grads tend to be top tier techs who bring interesting questions and good problem solving insight to the forums. They are skilled techs and potentially valuable content contributors. This deal is retroactive meaning that if you’re already a certified graduate of the Fundamentals course, you are eligible for this deal. If you’re already a PA member and a certified Fundamentals grad, we can move you to the MST Alumnus deal. So how do you get started on this gravy train? Easy: just fill out this short form, we’ll review it and set up your MST Alumnus account here at Appliantology mo’scratchie (that’s Samurai-speak for “quickly”). * Certified means that you meet all currently required quiz and exam score requirements for the course; see this page for details. 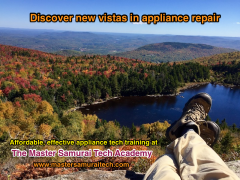 Who: Any professional appliance repair technician interested in learning more about effectively using Appliantology as an appliance repair information tool or sharpening their troubleshooting skills in the online training at the Master Samurai Tech Academy. What: This will be a guided web tour showing you the powerful but subtle features at Appliantology that make it such an effective troubleshooting tool. We'll also show you a quick campus tour of the Master Samurai Tech Academy-- what it has to offer you, how it works, how it can change your life, and how to enroll. When: Wednesday, April 11th 2018, at 7PM Eastern Time (adjust your time zone accordingly) Where: Just fill in the form below and the connection details will be automatically emailed to you: Fill out my online form. How: Here are three tips to ensure that the webinars are a smooth, cool experience for you: Arrive early to make sure your connection is working! Also, if you show up late for the webinar, you'll be lost. Enter your name at the "knock to enter" window on the meeting page. Watch this ultra-short video on how to use your Join.me control console. Who: Any professional appliance repair technician interested in learning more about effectively using Appliantology as an appliance repair information tool or sharpening their troubleshooting skills in the online training at the Master Samurai Tech Academy. What: This will be a guided web tour showing you the powerful but subtle features at Appliantology that make it such an effective troubleshooting tool. We'll also show you a quick campus tour of the Master Samurai Tech Academy-- what it has to offer you, how it works, how it can change your life, and how to enroll. When: Tuesday, March 20th 2018, at 7PM Eastern Time (adjust your time zone accordingly) Where: Just fill in the form below and the connection details will be automatically emailed to you: Fill out my online form. How: Here are three tips to ensure that the webinars are a smooth, cool experience for you: Arrive early to make sure your connection is working! Also, if you show up late for the webinar, you'll be lost. Enter your name at the "knock to enter" window on the meeting page. Watch this ultra-short video on how to use your Join.me control console. Who: Anyone interested in learning more about the online, on-demand training courses at the Master Samurai Tech Academy What: The Samurai will give you a personal campus tour of the Master Samurai Tech Academy. We can show some of the features of the site and then take you behind the scenes in our courses. We would also love to answer any questions you may have about enrollment and the training experience at Master Samurai Tech. We’ll show you how we can give you the competitive edge repairing today’s computer controlled appliances. As a thank you bonus for attending, we’ll give you a $50 tuition discount coupon! When: Thursday evening, March 8, 2018, @7PM ET (adjust your time zone accordingly). We will start right at 7PM ET sharp so please arrive a few minutes early. Where: All of our web meetings are powered by Join.me. &amp;amp;amp;amp;amp;amp;amp;amp;amp;amp;amp;amp;lt;a data-cke-saved-href=&amp;amp;amp;amp;amp;amp;amp;quot;https://mastersamuraitech.wufoo.com/forms/qxpoa3710ymgyd/&amp;amp;amp;amp;amp;amp;amp;quot; href=&amp;amp;amp;amp;amp;amp;amp;quot;https://mastersamuraitech.wufoo.com/forms/qxpoa3710ymgyd/&amp;amp;amp;amp;amp;amp;amp;quot;&amp;amp;amp;amp;amp;amp;amp;amp;amp;amp;amp;amp;gt; Fill out my Wufoo form! &amp;amp;amp;amp;amp;amp;amp;amp;amp;amp;amp;amp;lt;/a&amp;amp;amp;amp;amp;amp;amp;amp;amp;amp;amp;amp;gt; How: Here are three tips to ensure that the webinars are a smooth, cool experience for you: Arrive early to make sure your connection is working! Also, if you show up late for the webinar, you'll be lost. Enter your name at the "knock to enter" window on the meeting page. Watch this ultra-short video on how to use your Join.me control console. UPDATE: The Oven and Range Repair course is now open for enrollment. Click here for details. Team Samurai is turning up the heat this July with a new full-length technical course: Oven and Range Repair The content that we’ve created for you is absolutely fantastic. We cannot wait to be able to open the doors so you can see it for yourself. This is a mondo course, with over 30 original videos and 7 Case Studies, that was almost a year in the making using the same training structure for the prerequisite courses we developed for Sub-Zero Wolf factory training. The Oven and Range Repair training course covers all the technology used in modern gas and electric cooking appliances, ovens, cooktops, and microwaves, and includes seven real-world troubleshooting case studies using the world-famous Ten Step Tango® troubleshooting procedure. Next to refrigerators, cooking appliances are the most profitable appliances to repair, especially high-end cooking appliances. Any appliance company that expects to thrive and prosper in the coming recession needs to be competent at troubleshooting and repairing high-end cooking appliances and this course empowers any tech to do exactly that. Here's a list of the topics taught in the course: 1 Groundwork concepts 1.1 Basic electricity refresher 1.2 Conductor ampacity 1.3 120/240 VAC split phase power supplies 1.4 Ghost voltage and electrical measurements 1.5 GFCI and AFCI circuit protection 1.6 Gas fuel basics 2 Cooking appliance technology 2.1 Mechanical and solid state relays 2.2 Capacitive touchpanels 2.3 Motorized door lock assemblies 2.4 RTD oven temperature sensors 2.5 Electronic oven controls 2.6 Microwave oven operating principles and troubleshooting 2.7 Electric cooktop infinite switches 2.8 Radiant and inductive cooktops 2.9 Gas surface burners 2.10 Gas oven burners 2.11 Fuel conversion on gas ovens and cooktops 2.12 Gas burner spark ignition systems 2.13 Gas flame detection and burner reignition systems 2.14 Gas oven hot surface ignition systems 2.15 Direct spark ignition (DSI) systems 3 Seven troubleshooting case studies on modern, real-world gas and electric ovens and cooktops applying the principles taught in the course and the world-famous Ten Step Tango® troubleshooting procedure. 3.1 Dual fuel range - oven no heat 3.2 Double wall oven - long pre-heat 3.3 Dual fuel range - gas surface burner continuous sparking 3.4 Dual fuel range - gas surface burner no ignition 3.5 Gas range - bake burner no ignition 3.6 Gas range - low/erratic oven temperature 3.7 Electric cooktop - hot surface indicator light stays on The Oven and Range Repair training course will be released this coming Saturday, July 15, 2017, at the bargain introductory tuition of only $375. We'll announce the official release in our newsletter. Look for it in your inbox.